LINKSYS WPC54G - Wireless-G is the emerging 54 Mbps wireless networking standard that's almost five times faster than the widely deployed Wireless-B ( 802.11b ) products found in homes, businesses and public wireless hotspots around the country. The best part is, since they share the same 2.4GHz radio band, Wireless-G devices talk to existing 11 Mbps Wireless-B equipment. Early Adopters Pick, January 2003. The first high-speed wireless networking PC card for laptops to use the 802.11g standard, which is four times faster than the current standard (802.11b) and backwards compatible. 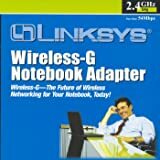 The new Wireless-G notebook adapter (PC Card adapter) from Linksys has both the 802.11b and newer 802.11g standards built in, so you can connect your notebook to existing 802.11b infrastructure and also the new, fast Wireless-G networks. The included setup wizard walks you through configuring the adapter to your network's settings, step by step. Then just slide the adapter into your notebook's PC Card slot and enjoy network access with your notebook computer, while retaining true mobility. Wireless-G is the 54 Mbps wireless networking standard that's almost five times faster than the widely deployed Wireless-B (802.11b) products that are found in homes, businesses, and public wireless hotspots around the country. But since they share the same 2.4 GHz radio band, Wireless-G devices also work with existing 11 Mbps Wireless-B equipment. Once you're connected, you can keep in touch with your e-mail, access the Internet, and share files and other resources such as printers and network storage with other computers on the network, wherever you wander. At home, you can surf the Web or use instant messaging to chat with friends while sitting out on the patio. You'll also be able to connect to any of the growing number of public wireless hotspots springing up in coffee shops, airport lounges, hotels, and convention centers. And as those hotspots upgrade to the new high-speed Wireless-G standard, you'll be ready to take advantage of the increased speeds. 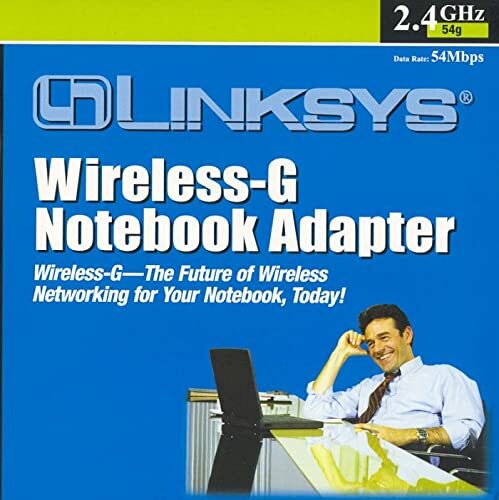 Get connected to current standard 802.11b networks today, and be prepared for the future with the Wireless-G notebook adapter from Linksys. Wireless networks are rapidly becoming more popular and coming down in price. Since they don't require cables, you can use the devices anywhere in an office or home, even out on the patio. There's no need to roll out an Ethernet network cable to each room of a house; you can network anywhere--without wires. Outside the home, wireless networking is available in hotspots at coffee shops, businesses, and airports--great when you're on the road and need to get some work done. For convenience, wireless networking is the answer. Which Wireless Standard Is Right for Me? 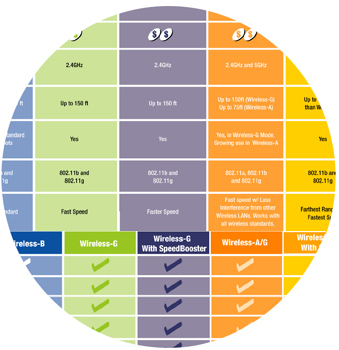 Now that you've decided to create a wireless network, the next step is to figure out which wireless standard to use. Basically, a standard is a set of specifications for a device. All devices that follow a specific standard share operating characteristics, such as the radio frequency used and maximum data transfer speed. The adapter worked great on XP. This card is terrible. I have the v3.0 version of this card. I bought it for a Gateway All-in-one PC that didn't come with wireless networking built in. I was replacing a D-Link card that was 802.11b only and thought this would possibly give me better data rates and I would also be able to switch the 11b compatibility off of my Linksys wireless router which could also improve performance. Wrong on both counts. My data rates actually dropped after moving to this card. Even though my PC (which is not portable) is located less than 20 feet away from the router/Access point, I consistently get a poor signal as reported by the included software. Several calls to tech support helped me update the firmware but even after a firmware update, the signal quality was unusually poor. Furthermore Linksys technical support was very rude on the phone thus making me rude on the phone as well. (I don't like when tech support makes me do that but sometimes you just have to give them tough love.) When I explained that I was adding this card to a desktop PC, it nearly fried the guy's brain. He insisted that I could not be putting this in a desktop PC and only laptop PCs have PC cards. Maybe they don't have desktop PCs with PCMCIA cards in India (where the tech support guy was) but they are sold around the world. Anyway, after the useless tech support incident and pointlessly attempting to update firmware I still have poor signal and terrible data rates. So I switched back to my trusty old D-Link 802.11b card. At least that was reliable. Also, the included software is garbage. If you can, just forget about installing it. If you use Windows XP or Vista, the Windows wireless LAN manager works quite well (as well as it can with such crappy hardware) with this card making the Linksys crappy software completely unnecessary. Word of advice to Linksys... fire the guys who write this crappy software and put that money into better customer support and improved compatibility with your own products! Had one previously, this recent version occasionally hangs my router. I bought this to replace my original Linksys WPC54G adapter that gave up the ghost. I thought it would be just a simple matter of taking the old WPC54G card out of the PCMCIA slot and slapping this one in... not so. Original card was version 1.3, this one is version 3.2 and the newer driver has to be used, I found that a complete uninstall of the old card and Linksys monitor software & driver needed to be done and a "ground up" install of the new card performed to get it properly installed. For reasons yet unknown, occasionally after booting up, my wireless connection does not connect with my Linksys WRT54G wireless router, which is a version 2.1, upgraded to the latest firmware v41.1. Error message is " Cannot associate with the access point". Whenever this happens, I discovered that other PC's (laptop & desktop) in the household with Linksys wireless adapters also would not connect with the router on boot up or if they were up while my laptop booted up, their connections would drop. Long story short, after sloughing through the Linksys support web page and not finding an answer, I decided to try a power off/on reset of the WRT54G wireless router. All adapter cards were then able to establish an association with the router and access the internet. Each time that this has happened, the fix has been to reset the WRT54G router, and it looks like it intermittently gets hung when the newer version WPC54G tries to connect. No other firmware updates are available for the version of the WRT54G wireless router that I have, and I'm contemplating replacing it with a newer version, but as long as the old one works after doing the reset, we'll see how things go... but it's an annoyance I'd rather not have. Oh, and I'm running windows XP Professional SP2 and I have not found any XP fixes on the MS Update web page that matches this problem. I never recieved the correct part. I ordered one part, and they sent me the wrong part. I bought this card to work with my Linux laptop. It does not come with Linux driver and it is not easy to make it work with Linux but possible. If I had to buy another card I would buy some other more Linux friendly vendor. I chose a Lynksys adapter because of name recognition. I have been using it for a month and so far, it has functioned as advertised. 1) make sure your notebook has a wi-fi adapter port. 2) find out what kind of network is running where you will be using wi-fi. Some networks use type b, others use type g which is newer and faster. The Lynksis WPG54G runs on both. 3) read and follow instructions carefully. Better yet, get your IT guy to set it up. If set up wrong out of the box, you will spend alot of time trying to get it right. PURCHASED THE WIRELESS ADAPTER ALONG WITH THE SAME BRAND WIRELESS ROUTER. It connects for a while, and when I change the encryption, it becomes very spotty. I try using the repair function under windows, it will fix it if you are connect to the LAN cable. The connection will fail after a while you disconnect the LAN cable. Conflicts with the Windows wireless connection.